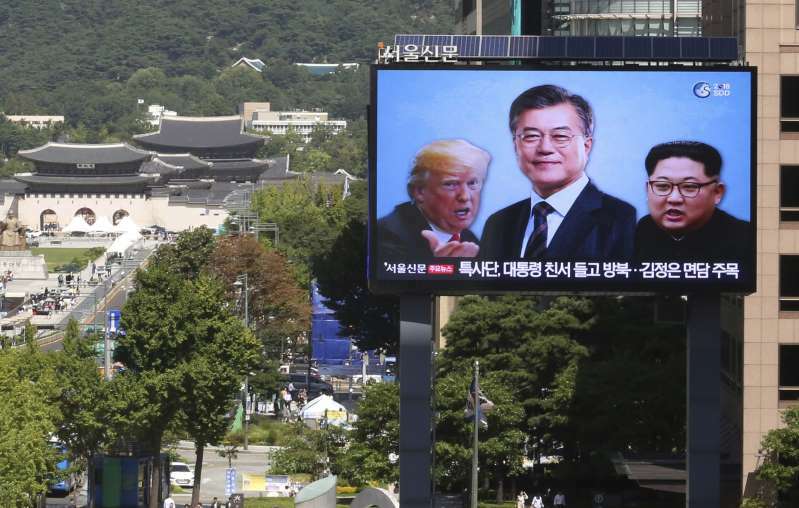 © Ahn Young-joon/AP A giant TV screen shows images of North Korean leader Kim Jong Un, right, South Korean President Moon Jae-in, center, and President Trump in Seoul on Sept. 5, 2018. The enthusiasm and optimism of the South Korean government over its outreach to the North is on open display. A huge image of President Moon Jae-in’s first meeting in April with North Korean leader Kim Jong Un adorns Seoul’s City Hall. Photo booths around the city allow people to pose against summit backdrops. And on Tuesday, Moon heads to Pyongyang to meet Kim for the third time this year. This much is clear: Moon’s administration is leading the cheerleading about the dramatic diplomatic advances even as U.S. exchanges with the North appear to stumble. Only by building trust, Moon’s supporters argue, will Kim be convinced to dismantle his nuclear weapons program. This approach stands in sharp contrast to views from within the Trump administration that Kim must take it all down before U.S. largesse can kick in. The South, instead, has opted to court Kim’s regime gradually. The easiest items came first: family reunification events, cultural and sports exchanges and South Korean business forums to look at a post-sanctions peninsula. Recent days have brought a possible move into harder and more substantial rapprochement with the opening of a quasi-diplomatic “liaison office” that allows round-the-clock communications between the two sides for the first time since the Korean War. “Together with the international community, we must provide North Korea with all the support and encouragement to make the right choices for itself,” National Security Council Director Chung Eui-yong told a defense forum in Seoul on Thursday. It is an outside-the-box strategy that just might work. But it also causes disquiet within Trump’s administration, among South Korean conservatives and in the region’s other cornerstone U.S. ally, Japan. The Moon government’s interactions with the North often sidestep the fact that Kim still leads the world’s most repressive totalitarian regime. The South’s eagerness to embrace the North Korea leader also has left Trump’s “maximum pressure” campaign in some disarray, critics point out. The fraying is most evident with China, the linchpin in the coalition that the U.S. president painstaking built last year to persuade Kim to negotiate. Beijing is enforcing international sanctions less aggressively this year, experts on North Korea’s economy say. Trump’s starting a trade war with Beijing has not helped. Critics of Trump also point out that there were no clear timetables or benchmarks set in Trump’s landmark Singapore summit with Kim in June. “Since there was no detailed action plan, North Korea doesn’t take any detailed action,” said Shin Beom-chul, a senior fellow at the Asan Institute for Policy Studies in Seoul. At the Seoul defense forum, South Korean ministers and their deputies praised the North for dismantling its nuclear weapons test site at Punggye-ri in May, and they supported Pyongyang’s demand that the United States reciprocate by officially declaring an end to the 1950-1953 Korean War. There was talk of a “precious moment” in history, and of the Korean Peninsula making a huge contribution to world peace. But skeptics see North Korea pocketing the goodies on offer from Seoul and Washington — including a suspension of U.S.-South Korean military exercises — without offering irreversible, verifiable concessions in return. Meanwhile, Pyongyang is adept at exploiting divisions between countries, or even within the U.S. administration itself between Trump and others who prefer more cautious moves with Kim. Still, there are those in Seoul who are convinced that Kim understands that opening up the economy is the only way for his government to survive. Yoon Young-kwan, a professor at Seoul National University and former foreign minister, is among them. He notes that Kim apparently told a team of South Korean envoys this month that he hopes to achieve denuclearization before the end of Trump’s term. Presidential adviser Moon Chung-in was one of the architects of the Sunshine Policy of engagement with North Korea two decades ago. He also has faith in Kim but argues that the question of whether he is sincere is, at this point, irrelevant. “If the North Korean leader says ‘I want to get rid of my nuclear weapons,’ then we’ve got to talk to him,” he said.